3Integrity Check, Reindex and Vacuum - Beware! 4.2.4Comment: "The following menu items are active (red text..."
RMtrix collects a bunch of SQLite queries under a simple, easy-to-use interface. It does many of the queries reported on this wiki – some of the menu items are dormant. RMtrix is intended to progress the development of a more comprehensive set of utilities going beyond the limitations of the database language by itself and make them available to and usable by the average user of the RootsMagic software. Kim Mills has done a very clear, well illustrated explanation of how to use functions in RMtrix to split shared events prior to exporting and uploading to Rootsweb and Ancestry.com trees. Read it on her Footsteps of the Past blog. Alpha-7 has many additional tricks gathered from the last nine months of SQLite Tools for RootsMagic..
Screenshot from RMtrix alpha-7 querying the properties of the RootsMagic 6 database stored in the file “RM6-PLAY.rmgc”. Now uses a RM6.0.0.4 database (reported as 6000) as the reference for comparing source templates, fact definitions, etc. Note that you can sort on any column by clicking on the header and you can change the order of the columns by dragging one at a time. These arrangements do not persist through to the next running of the query. I’m a novice at Visual Studio and C# and have not taken steps to automatically protect or backup your database. 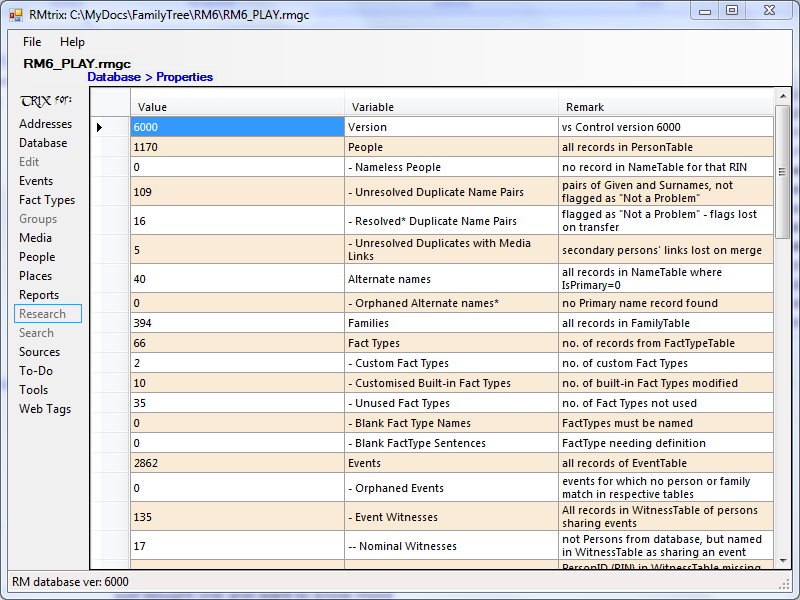 So get to know RMtrix by using it on a copy of your database. Some of these functions modify your database and are so flagged in the Tool Tip popup when the mouse pointer hovers over the menu item. Integrity Check, Reindex and Vacuum – Beware! RM5 & 6 databases may be Reindexed or Vacuumed in RMtrix for its use and then, on return to working with RM5, use its File > Database Tools > Rebuild Indexes. RM4 databases should NOT be Reindexed or Vacuumed in RMtrix. At some future stage of development, hopefully there will be protections built in to prevent changes to RM4 databases that could result in indexing errors. Download the 32 bit or 64 bit version (match your computer’s operating system) to a temporary location on your computer. If your operating system does not open the zip file, you will need an unzip utility to extract all the files and sub-folders to another temporary location. Then open the file “setup.exe”. If your computer does not have the .NET Framework 4 already installed, the installer program should automatically download it from Microsoft and install it before completing the installation of RMtrix. If the installation is successful, RMtrix should open on screen. You should also find a RMtrix folder in your Start Menu. Please report successful or problem installation to me at ve3meo at gmail dot com and indicate which version of Windows is on your computer and whether 32 or 64 bit. This will help confirm that I have correctly used the Visual Studio Publish tool. Getting an error message when you select a database along the lines of “Could not load file or assembly ‘System.Data.SQLite … or one of its dependencies”? I have an older ThinkPad running Windows XP which was giving me this problem getting the 32-bit version of RMtrix to work. The same issues might pertain to computers running later versions of Windows with either the 32 or 64 bit version of RMtrix. I develop on a 64-bit Windows 7 computer with all the bells and whistles of .NET Framework 4 and the full system.data.SQLite install so getting it to work there does not necessarily guarantee that it will work on other systems. RMtrix uses the version of SQLite that requires Windows .NET 4 Framework (not just the Client). The installation of RMtrix may not have resulted in the appropriate version of .NET, so Install .NET 4 Framework, the full version, not the Client. You will be given a choice of three things to install – you only need the first of the three, unless you are a developer, the one for running applications. sqlite-netFx40-setup-bundle-x64-2010-1.0.79.0.exe or later, for 64-bit Windows. If you have not previously installed the correct version of .NET 4, System.Data.SQLite will not install. The install was fine – totally uneventful. I’ve played with the functionality slightly, and I have no comments at this time because I haven’t had time to play enough just yet. The packaging is the first thing that needs to be right, and then the functionality can be developed from there. The packaging seems to be doing well. Thanks for the report, Jerry. I have also received private confirmation of a successful 32 bit and another 64 bit installation so the distribution mechanics seem to be right. I’ve had one report of a 32 bit installation failure – program starts but no query works – which I hope is due to it being installed on a 64 bit machine/OS. FYI, I am building on a 64 bit Win 7 platform with the sqlite.interop.dll and system.data.sqlite.dll from the 64 bit distribution. That’s needed to debug and run on my computer and for the 64 bit published version. However, on 32 bit machines, the 32 bit system.data.sqlite.dll is required, but I cannot debug and build with it. So I replace the 64 bit dll with the 32 bit dll in the source directory and re-publish, ignoring the warning about a mismatch. I could simply tell people to install the 64 bit version and replace the dll but Windows One Click installs it deep in an unsearchable area. That info may be helpful to you when you are ready to publish your Group and Color-coding Manager. Is it OK to delete the RMtrix64 set up files after installing the program? Yes. For the next upgrade, download to the same place you installed this version from else it will not let you upgrade without uninstalling. After some fiddling and false starts, probably because I have not worked with RMTrix for a while, I have installed RMTrix under Windows 10 64-bit. It has already helped identify the broken links in my media album. Thanks, Tom! I’m relieved to hear that, Rex, because I had no idea how to figure out what went wrong. I have been busy adding more of the queries from the wiki. Some wrinkles here and there but progressing, including some that DO modify the database. Didn’t have time to build the 32 bit version – maybe tomorrow night – so holding off on the upload. But don’t let that deter you from installing the current version – I’d like to know that the package is complete and installs successfully on both 32 bit and 64 bit systems.